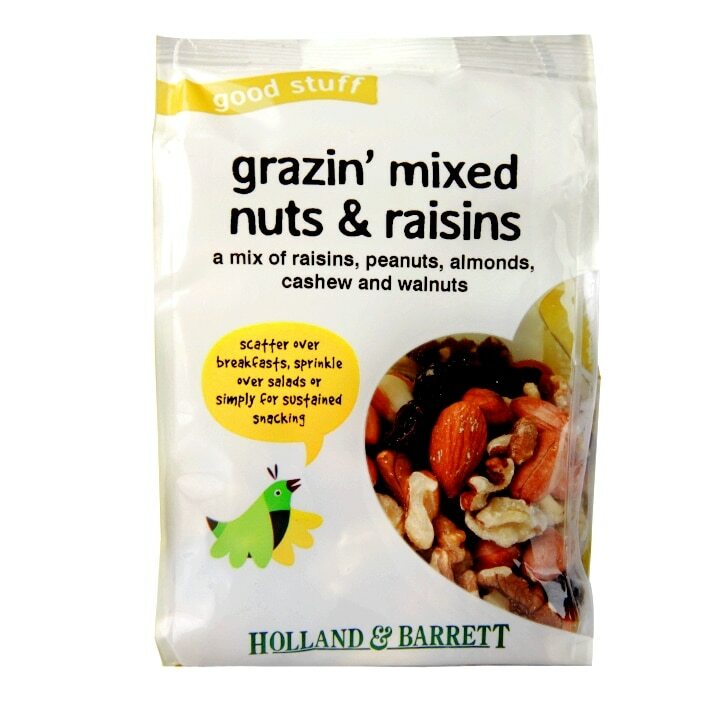 Holland & Barrett Mixed Nuts & Raisins is a medley of customer favourites. This pack contains walnuts, almonds, cashews and raisins, perfect scattered over breakfasts or sprinkled over salads. Almonds (15%), Cashews (15%), Walnut Pieces (15%), Brazil Nuts (15%), Flame Raisins (15%) (Raisins, Sunflower Oil), Cranberries (15%) (Apple Juice Concentrate, Cranberries, Sunflower Oil), Golden Raisins (10%) (Raisins, Sunflower Oil, Preservative: Sulphur Dioxide). Holland & Barrett Mixed Nuts & Raisins is rated 4.6 out of 5 by 82. Rated 5 out of 5 by JKW1 from A Comprehensive Mix ! Compared to rival selections, the H&B mix is far superior, including nuts (like brazils & walnuts) that others don't. They tend to "fill" their bags with peanuts & leave out the ones H&B include. Always fresh, well packed, and excellent value too, I will continue buying if the content, quality & value continues.